It’s The Great Pumpkin Sandy Joe! Fall is upon us and with that comes one of my favourite annual spectacles: the Smoky Lake Pumpkin Fair! This was my third year attending and it did not disappoint. It was the 30th anniversary and boasted the heaviest pumpkin in the history of the festival! The pumpkin weighed in at a whopping 1884 lbs!!! But without further adieu, I present: It’s The Great Pumpkin Sandy Joe! Tune into the video above to get a vlog of the whole experience… right down to the infamous pumpkin drop! Thanks so much for joining me on yet another random road trip! It’s more than likely that I will be attending this fair next year – rain or shine, I’ll be there. In the meantime, if quirky road trips are an interest, check out my post and video about 5 weird places to visit in Arizona. Or my lengthy backlog list of travel articles I have been compiling over the years. As always, if you enjoyed this video and want to see me on the regular, subscribe to my YouTube channel – I appreciate each and every sub as I grow this new corner of my offbeat empire. I suppose it wouldn’t be fair to say this is *all* I did this summer. I also ran a 10K race with Lululemon. I went to the Stampede with GMC Canada, and camped in Kananaskis. I also went to Road Tripping to Gabriola Island where I unplugged for two whole glorious weeks. A vlog from that is yet to come! If you enjoy my videos, be sure to head on over to my YouTube channel to subscribe to be alerted when these videos are hot off the press 🙂 Thanks so much for stopping by. Up until last year, I had never been to the Calgary Stampede. Which, if you’re from Alberta, is a highly unusual feat to have accomplished by 30. Imagine my surprise when, this year, I was asked to attend yet again. This time, GMC Canada extended an invite that sounded much too intriguing to refuse. The itinerary was stacked, so I drove down in a loaned GMC Terrain and never looked back. What ensued was three days of all things western and wild. I rode a horse for the first time, I ate 7/11 pizza at 3am and reviewed it (for your viewing pleasure), and I even drove a couple of trucks! If you want to know what a roadtrip with me is like, definitely watch: Sandy Joe Goes to the Stampede: A Memoir. Keep scrolling for photo highlights I managed to take while we were out and about. 🙂 Yehaw! One cannot attend the Calgary Stampede without the proper attire. Despite being a country noob, I have been preparing to play the role of a country gal my entire life. (My collection of western belts tells that story eloquently) To top off my already cowpoke look, we popped by Lammle’s to boot up. I paired my Mae Cowgirl boots by Dan Post with my Bailey Cowboy hat. Describing the above photographs as Gourmet Cuisine is only half true. While we did dine at some insanely delightful places, (re: Pigeonhole, Proof) fair food and late night 7/11 was also on the menu. I regret nothing. Sandy Joe Goes to the Stampede: A Memoir would not be complete without a high / low dining experience. It’s a must. It’s a way of life. I also believe that one must specify both the circumstances and time of day a pizza from 7/11 is consumed because it provides much needed context for questionable choices. I think this collection of photos accurately depicts the highlights of the Stampede for me. Above is a shot from Nashville North, a large bar tent playing a healthy mix of country and rock music. It’s hard to say, I recognized very little of it. I quickly learned that as long as you had some item of clothing signifying a western style, then you could easily blend in without actually knowing anything. Fortunately, line dancing did not come up so I avoided being revealed as the true western poseur I am. 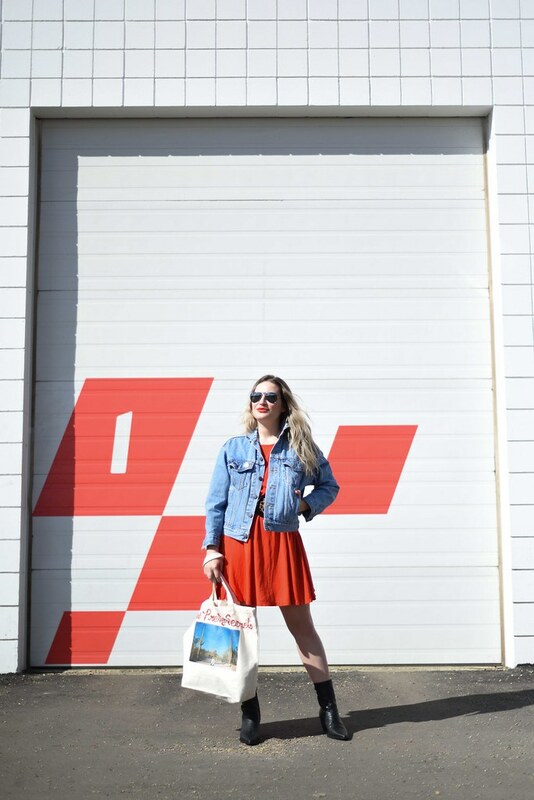 If this wasn’t enough Stampede realness for you, check out my other two posts from last year: Out & About Calgary Stampede and my style feature Sweetheart of the Rodeo – titled after a Gram Parsons tune for The Byrds. Many thanks to GMC Canada for having me on this amazing trip! Edmonton shoppers rejoice! The first official outlet mall has finally landed – pun intended! 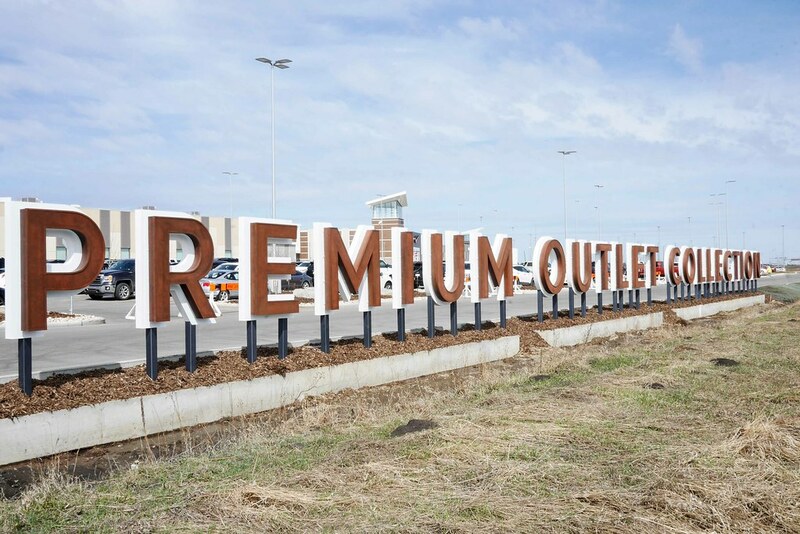 The Premium Outlet Collection Edmonton International Airport had its grand opening May 2nd to the excitement of many. The lineup on opening day began at the stroke of midnight and by 8am was wrapping around the building like a fashionable snake. Missed the first day? No worries, the festivities are continuing throughout the opening weekend. 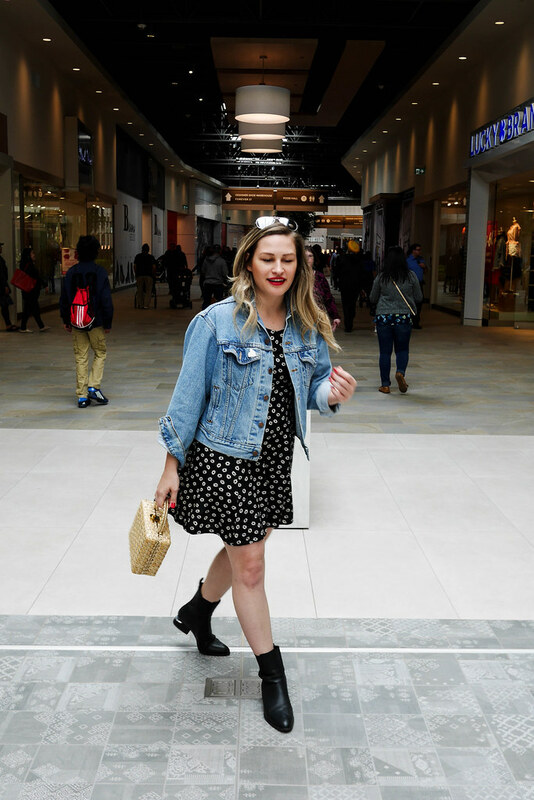 Keep scrolling for your first peek of the Premium Outlet Collection Edmonton International Airport and what you can expect from this fantastic shopping destination. I’m sure the first question everyone has is: “what stores can I expect to see at the Premium Outlet Collection Edmonton International Airport?” I’m all about anticipating people’s needs. With that in mind, here are some of my favourite shops I’m excited about. Keep in mind these are the real deal outlets! First off, Levi’s has landed, bless the denim gods! As well as DSW, ALDO, H&M, Forever 21, Nike Factory Store, and Kate Spade (opening this summer!) to name a few. You may also recognize a few local retailers such as Cloud 9 Pajamas and Kelly Wollf. One of the standout features within the Premium Outlet Collection EIA is Share, a retail concept designed to host a little marketplace of local goods. It’s a combination of locally made food and items from Edmonton’s makers community. Enjoy a 49th Parallel craft brewed coffee from Square 1. Or delight in a classic Hong Kong dessert from Bubble Cream. Wondering what that is? I’m glad you asked. It’s a fluffy egg waffle paired with ice cream and should not be missed. After buzzing from those two stalls, hit Eat Clean for a nutritious and delicious meal. All while browsing the art and design from local makers. Sounds like the perfect cozy corner to me! It seems as though they have thought of everything in regards to accessibility! Not only is it easy to find off of the QE2, the 747 airport bus from Century Park makes a stop at the Premium Outlet Collection Edmonton International Airport! There is also a special shuttle from the airport should you have some spare time between flights. I foresee this being my go-to spot when waiting to pick up arriving friends and family members. There are many hurdles when travelling. The hauling of things, the security, the general uncomfortableness about the whole process. Wouldn’t it be nice to take some of the grunt work out of it? That’s where the outlet mall amenities enter. To begin with, they have a “refresh room” for travellers to change and regroup. In addition to that, there’s luggage storage, coat and bag checks, cell phone charging stations, and most exciting: DeliverEase, a parcel shipping and delivery service. Ship parcels anywhere without having to figure out how to squash them into an overflowing suitcase. There are even flight status screens and boarding pass printing stations to avoid the anxiety of missing a flight. Opening weekend is here and there are a few ongoing events and prizes to be won from May 2nd-6th! Some of the coveted prizes are vacation packages to San Francisco courtesy of Air Canada and EIA, Grey Cup tickets, Oilers tickets, and more! Many shops are offering opening weekend specials such a Levi’s with 25% off their ENTIRE store. See the complete list of the Promotions and Events at the Premium Outlet Collection shops. Another one of the opening weekend activations is the United Way Tote Bag Contest. 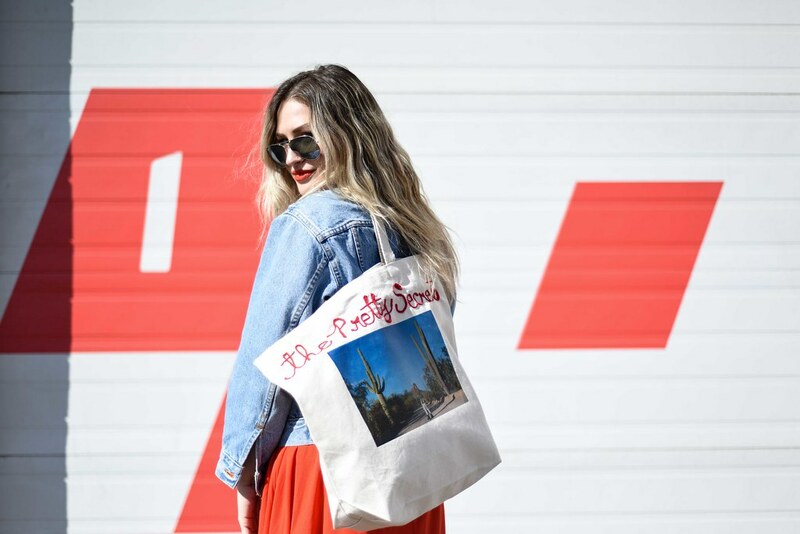 Myself along with other local influencers and celebrities took some time to DIY tote bags that you can vote on here: VoteForYourTote.ca. You might see a familiar picture of Saguaro National Park in there! 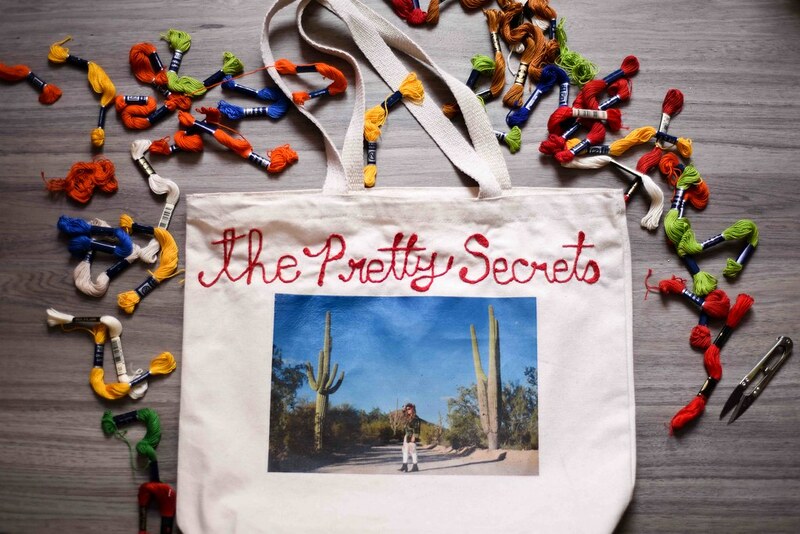 I taught myself how to embroider just for this specific occasion so if you dig my tote, please vote on it! 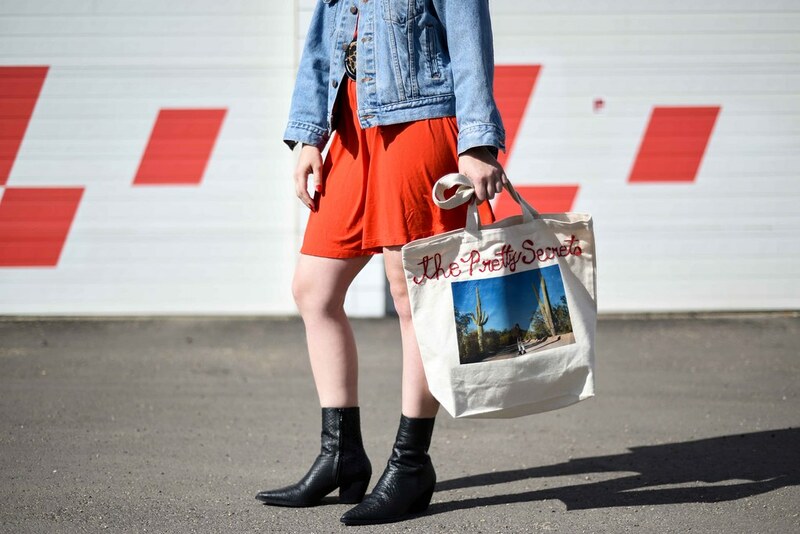 🙂 For ever vote received, $1 goes to the United Way Alberta and each voter is then entered to win their favourite tote + a $1000 shopping spree from Premium Outlet Collection Edmonton International Airport! Tote bags are on display till May 23rd. Finally, we have come to my favourite topic: food. To call this area a food court would be a mistake. This eating area is far too bright and airy to evoke the feeling of a classic food court. It’s more akin to being in a really nice kitchen where the furniture is moveable and the seating is comfortable. Not to mention, there’s an array of delightful places to eat and a Starbucks that offers their Nitrogen Cold Brew. This post is sponsored by Premium Outlet Collection EIA. All opinions on this blog are my own. There is one brilliant way to ease into the month of October and that’s by attending the annual Smoky Lake Pumpkin Festival. Forget the pumpkin spice lattes, this fair is the real deal. The town of Smoky Lake even has a decorative pumpkin patch roadside attraction, I can add that to my list of roadtrips to the biggest and best kitsch monuments. Do you love autumn so much that you would drive an hour and half out of town to celebrate all things gourd related for a full day? I guess I do since this was my second year attending. From the great pumpkin weigh off to the farmer’s market with endless pumpkin desserts to choose from, this is an event not to be missed, especially since it ends in a giant pumpkin dropping from a crane onto a car… more on that later. An autumnal day in the prairies is the perfect weather for a drive. The pale yellow of the harvested wheat fields against the dark and stormy backdrop of the distant skyline creates a certain ambience and general Charlie Brown-esque feeling. This is truly the colour palette of the prairies. We arrived just past noon and in time to catch the weigh off of the top 3 pumpkins. The last one, a behemoth of a gourd, beat the longstanding weight record of the 29 year old festival. Weighing in at 1652 lbs, that pumpkin was no joke, I’m surprised it didn’t cause the forklift to topple over as it delicately placed the great pumpkin on the scale. What a day to be alive! After the weigh-off was the pumpkin auction. That was a raucous event in itself with a large crowd vying for a mutant gourd to take home. I enjoyed the frenzied bids from a distance while sampling the baked goods from the market. Pumpkin cinnamon bun anyone? Ever wondered what it would look like to see a morbidly obese pumpkin drop from the sky on to a car? Today is your lucky day…. below is footage of two smashing pumpkins. Legend has it, the town of Smoky Lake asked the Smashing Pumpkins to play the pumpkin festival. They, allegedly, declined. Here’s to another year of ringing in the fall season with the annual pumpkin festival! I’m already looking forward to seeing the pumpkin drop of 2018. I’ll be counting down the days beginning…. now! Perhaps I need to invest in a knitted pumpkin toque? For more information on this wonderful fair, check out the Smoky Lake township site here. What do you say when a friend offers you two tickets to a pop-up dinner on the 27th floor of a newly opened high rise tower? Yes, emphatically YES. That’s exactly how I found myself at the second Culinary Lab Series atop the Edmonton Tower with my handsome man friend. What a delicious time that was! To celebrate Canada’s 150th, 5 chefs from across the nation were brought together to experiment with Canadian sourced ingredients to make a one off menu for an evening. Sounds pretty rad, right? It was. Our seats were at Chef Mandel Hitzer from the Deer + Almond in Winnipeg. Keep scrolling for some delectable dishes. Trappist cheese, grilled chantrelles, apples. I kept it casual wearing a full look from Frank & Oak because that’s apparently how I roll these days… light cotton top and a pair of high waisted mom jeans. Side note – the top is currently on sale here and basically my favourite thing to wear every. single. day. I could live in light weight cotton! The second course was a spin on a classic beat and goat cheese salad with the addition of Artic Char, carrots and sea buckthorn. Fun fact – I use sea buckthorn oil on my face as it is super nourishing for your skin! This soup. There are no words for how ridiculously good this soup was! It included smoked goldeye, gnocchi, whitefish roe, and a crayfish broth. That broth though, it was creamy and salty, but not too salty. I will have dreams about it for years to come. This was paired with Main Squeeze, an Alley Kat beer. This was supposed to be a short rib but apparently they did not materialize so this piece of magic pork arrived instead. I was not disappointed in the least. The peas, kennebec potatoes, and swiss chard were a perfect combination of vegetables to accompany it. Dessert is always my favourite course without a doubt. Tonight was no exception. We were treated to Manitoba blueberries with sourdough panna cotta and sunflower seeds. This was paired with a sparking wine, Stoneboat Piano Brut. I have recently become quite enamored with panna cotta, the consistency is so interesting – not quite yogurt, not quite jello; just a quiet perfection, much like this whole experience. Many thanks to Danny Ross of General Concern for creating the space as well as having us!